أعلنت الحكومة الأمريكية عن فتح باب التقدم للهجرة العشوائية لعدد 50 الف شخص من مختلف الدول، للاقامة والحصول على جنسية الولايات المتحدة الامريكية وذلك لتلبية النقص العددى فى بعض الولايات، وهذا البرنامج ليس جديد فهو يتم بصورة سنوية، حيث يتم القبول بصورة عشوائية عن طريق سحب يتم بصورة سنوياً. Svp,je veut savoir comment va faire je suis intéressé. Merci d’avance. أنا مصري أعزب ليس لدي زوجة ولا أولاد حاصل علي شهادة دبلوم فني رسم و تصميم ميكانيكي..معهد فوق متوسط..
Bonsoir,je suis un Technicien deplome je suis sérieux ,dynamique ,disponible s il vous plais contacter moi au n 0636857740est merci pour votre attention . Iam interested in living in Canada, because of the worse conditions in my Yemen country and the difficulties of living which caused by the war. 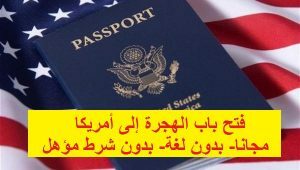 ولقد تقدمنا سابقا راجيا ان أوفق هذه المرة . It is good if we can get this good chance to go to this great country. hank you for this beautiful initiative and would love to be one of the immigrants to America. I would like to thank you for giving me the opportunity to apply for this position and believe that the job requirements and my skills may be a good match. As mentioned in my resume, I have extensive experience in sales, with more than 2 years of experience in sales and other jobs. I have bachelor degree in networking and computer skills and graduated from the University of Versailles SaintQuentin-en-Yvelines.in 2015. Currently, I am employed as technician in Stm. For your convenience, please find herewith my resume. Thank you for considering my application. I WANT TRAVEL TO America، my age is 41 years. I live in sana،a. Thank you.